Standoff on the Mall: What do the videos actually reveal? The additional video footage does add some complexity, said Ruth Graham in Slate.com, but it doesn’t “exonerate the kids in the red caps.” The extended footage actually shows some of the teens performing tomahawk chops, dancing, and sneeringly mimicking Phillips’ Native American chanting. At best, that’s offensive; at worse, racist. And although Sandmann released a statement—written by a public relations firm his parents hired—insisting he’d been silently praying and trying to “defuse” the situation, the sneering privilege of his smirk and red MAGA cap as he blocked Phillips’ path tell a different story. Don’t “doubt what you saw with your own eyes,” said Laura Wagner in Deadspin.com. An elderly member of one of America’s most marginalized communities was taunted and mocked by a “writhing mass of sneering young white men” clad in the “racist, misogynist paraphernalia” of our toxic president. This incident has quickly become a political “Rorschach test,” said Julie Zimmerman in TheAtlantic.com. Based on whether you see Phillips or Sandmann as the victim, “I can probably tell where you live, who you voted for in 2016, and your general take on a list of other issues.” That’s a sad statement about how utterly polarized we’ve become. We’re “living through an American Rashomon,” said Tony Norman in the Pittsburgh Post-Gazette. 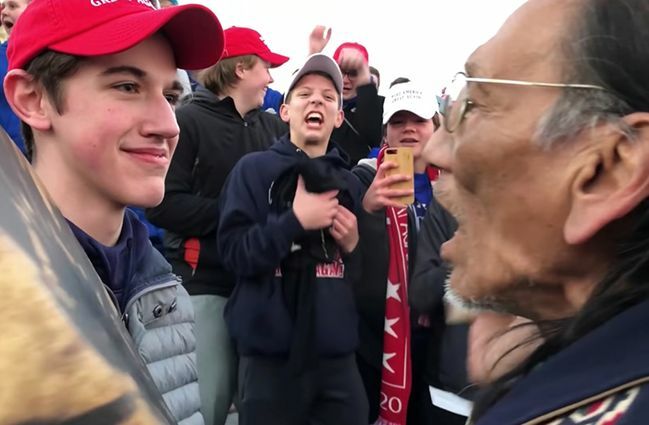 The haunting image of a white kid in a MAGA cap locking eyes with a Native American perfectly captures today’s “messy, divisive, dispiriting and thoroughly humiliating American reality.” What people see in that image reveals more about their biases than about objective truth.